Yours, Mine and Ours: Rene Russo and Dennis Quaid sleepwalking throughout a messy, corny and utterly boring plot. The Family Stone: I was expecting a mix of sentimental (it being a Christmas themed movie) and self-indulgent SJP movie, but it wasn't like that, well, maybe a little in the beginning. But there are some honest, painful moments, an intelligent plot, well-paced script and likeable characters to make the movie worth watching. Everlasting Regret: Is it just me or does Sammi Cheng have only one expression for every emotion she is supposed to be emoting? But still enjoyable to watch for its male characters, all of them strong, silent and a little tortured. I never mind sitting through anything in which Daniel Wu or Leong Ka Fai appears. Election: What is a plane journey without a triad movie? This is highly riveting, moody and thought-provoking, i.e. a better movie than most of its genre. It has a big cast of very watchable HK actors too, including Tony Leung (again), Simon Yam, Nick Cheung, Louis Koo. Parineeta: I watched this movie twice because it was so entertaining, a very good-looking and talented cast, gorgeous cinematography and a storyline that is, sigh, more romantic than Titanic. What was absent in the experience of watching movies on the plane was something small to chew on. Like deok. 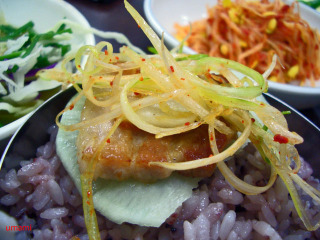 Deok is a catch-all name for Korean rice cakes. 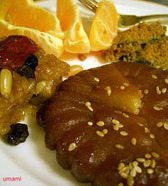 We in South East Asia may have our kuehs made with rice, palm sugar and santan. The Koreans make equally delectable sweets with their rice too. Above left, clockwise from the orange slices: Sticky, chewy rice cakes with seaweed flavours dusted with soya powder, oily sesame crusted fried biscuit that every Korean I know loves, and a zhong-zi like cake of glutinous rice, raisins, pine nuts and red dates. 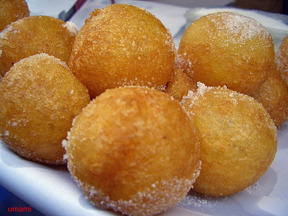 The last was my favourite, they cost about 2000 won each and are so simple and delicious I wish I brought back a dozen. Above right: rice balls with cinammon-flavoured paste - this I didn't like because I don't particularly like cinammon. The rectangular cakes are pressed with pistachios and sweet red dates, now these are very toothsome. I know, there is a deok shop near Sin Ming Road but it has weird operating hours. Writing about this makes me long for some, and I hope I will be more lucky next time I visit them. Our baking adventure for this week was to make a Lemon Yoghurt Cake, using the recipe from my trusty "Best Ever Baking" by Carole Clements. The only modification I made was to add a capful of orange oil and double the amount of lemon zest, aye, I love my citrus flavours. An indecent amount of butter was creamed with an equally obscene amount of sugar until pale. Egg yolks went in next, slowly, followed by lemon juice, yoghurt and lemon zest- the lemon juice initially made the batter look a bit curdled and got me a little worried but it didn't affect the end result. Sifted flour, baking powder and bicarbonate of soda was incorporated and finally stiff egg whites beaten with a little salt was folded in. Bake at 180 C. A light frosting made with lemon juice, icing sugar and yoghurt was drizzled over the cakes when they cooled. Everyone agreed that this has to be the best tasting cake to have emerged from our oven so far. Just the right sweet-sour balance. 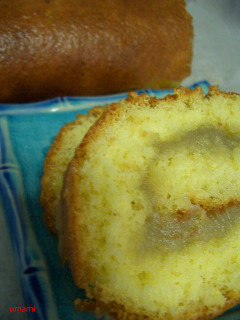 The yoghurt seems to be the magic ingredient that made the rich butter cake less cloying and also gave it a very soft, tender crumb. Simple and good, which means that I'll probably make it again soon. This was only the second time I made my own kaya. I remember how tiring it was to constantly stir the rich egg jam from the first time round and was therefore not in a hurry to do it again. This time though, I was in the mood to have a go at making KL-style kaya swiss rolls. And as I have not come across an acceptable commercial kaya there was no choice but to make my own. I used an old family recipe that Chan-Che dictated down the phone to me years ago soon after I became married and domesticated. It's simple, she said, take one bowl of sugar, one bowl of eggs, and one bowl of santan. My, they sure don't stint on the unhealthy stuff in the olden days. The first time I made it, I thought she meant "take a bowl of whole eggs" but when I checked with her, she emphasized that the bowl measures cracked eggs, literally as many eggs as it takes to occupy the space in the bowl! Another thing, this makes a brown kaya, not green. Our recipe does not call for pandan leaves, simply not done, said mummy. I started by measuring out a medium sized bowl of freshly squeezed santan (coconut cream), then used that same bowl for eggs, and finally the sugar. Incidentally, the eggs I bought from the egg seller at Whampoa market were rather odd, about half of them came with twin yolks. The santan went into a double-boiler bowl. A double boiler is simply a metal bowl set atop another pot bubbling gently with boiling water. Traditionally kaya is cooked in a typical yellow-enamelled double boiler that is still sold in Singapore, but I found that it was difficult to control the heat with that beast so this time I used my good pots which turned out to be a better idea. Anyway I am running ahead of myself, we haven't started on the cooking yet. The eggs and sugar went in next, but before this can be done these two ingredients have to be combined and sieved through to remove any lumps and bumps. An optional and quite tiresome step. The mixture was cooked slowly over the gently bubbling water until it thickened, constantly stirring to remove any lumps or prevent curdling. With the yellow double-boiler this process took me nearly 2.5 hours and I was dripping in sweat by the end of it. My three-ply cookware (Tupperchef) managed it in a relatively painless half hour. Meanwhile, in another saucepan I made caramel with 1/2 cup of fine sugar. When the kaya thickened the caramel was added to give it a richer darker colour. I made too little caramel as I was worried about getting sugar burns, next time I will double the amount. The heat was turned off once the desired thickness was reached. It didn't look pretty but tasted very good, very rich, sweet and custard-like. Excellent eaten with toast though I have to say, my favourite is to sandwich a generous layer between two cream crackers with or without a thin slice of cheddar cheese for that sweet-salty combination. Or, in this case, we could spread some over cake. I used Judy's recipe for log cake, a recipe which turned out quite well when we first tried it ( quite tender and tasty especially with my boozy apricot cream cheese filling). This time though, I couldn't get it right even with two attempts. 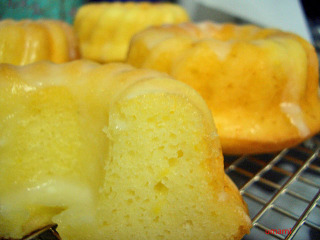 The first time resulted in an oily cake, the second had one too many flour pockets. I wasn't about to make a third so we used the floury cake. It rolled up good and looked OK but was rather dry. I can just imagine everyone surreptitiously picking out the swirly kaya bits and chucking the cake pieces, I certainly would if I were them. Sigh, it looks like we have a long way to go in the swiss roll category. As a novice baker I find that it is generally a good idea to bake more than one item at a time as there will be a good chance that at least one product will be edible. The odds improve further if one is making cookies or biscuits, which are easy to make and less prone to disasters. 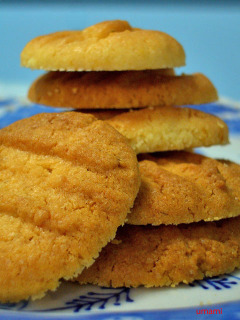 Such as the Orange Biscuits above, made from a recipe I adapted from the Best Ever Baking book by Carole Clements. It was buttery and redolent with the gorgeous aromas of orange oils and zests. I cut down the amount of sugar from 200g to 150g, which in itself is already a shocking amount, and this resulted in a just-sweet-enough biscuit that did not overpower its oranginess. 1. Cream butter and sugar till light and fluffy. Add yolks, orange juice and rind and continue to blend. 2. Sift flour, salt and baking powder. Add to the butter mixture and stir until it forms a dough. 3. Wrap dough in greaseproof paper and refrigerate for 2 hours. Or if you are impatient like me, you stick it in the freezer for 25 minutes while you make your next product. 4. Set oven to 190 degrees C and prepare cookie pan. Take out dough, roll spoonfuls of it into balls and place on cookie pan. Press down with fork to flatten. 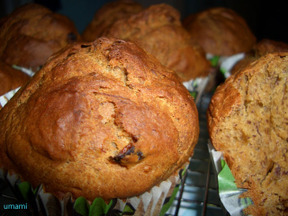 While cookie dough was getting a chilling, I made banana muffins with some ripened bananas, muscovado sugar and raisins. Recipe came from the same book as the cookies but it failed to tell me I should not overmix. As a result my muffin turned out quite breadlike. Still, it rose quite respectably and made for a fine breakfast food the following day. The cooking bug has not abated. Not satisfied with the Tiong Bahru Hainanese pork chop curry lunch, I decided to make it myself a few days later. 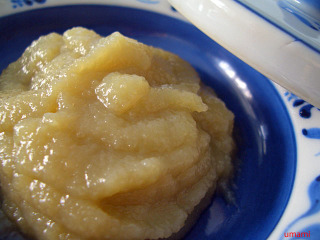 This was accomplished by merging Chan Che's recipe and a version found in Sylvia Tan's Singapore Heritage Food. Easy peasy. Incidentally the recipes in Sylvia's book do not interest me as much as the nostalgic photographs found inside. Pork: sliced thinly, beatened with mallet, and marinated with salt, pepper, a little wine & ginger juice. 1. Fry potatoes till brown. Set aside. 2. Dip pork slices into egg, then flour and then breadcrumbs/ crushed crackers. Deep fry till golden brown. Let it cool before cutting into long chunks and arranging on a serving dish. 3. Heat some oil in wok, add the cornflour and sauce mixtures. Bring to boil and let it bubble and thicken a little. 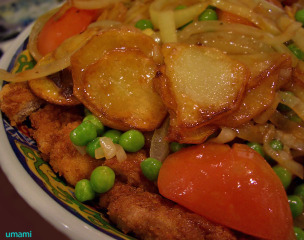 Stir in onions, tomatoes (do not cook through), peas and fried potatoes. Pour everything over the pork slices. Serve immediately with rice.